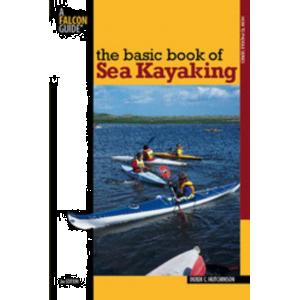 While no book about sea kayaking is enough to make you a pro paddler (this requires training and experience), "The Complete Book of Sea Kayaking" provides a comprehensive outline of the skills required by aspiring sea kayakers. 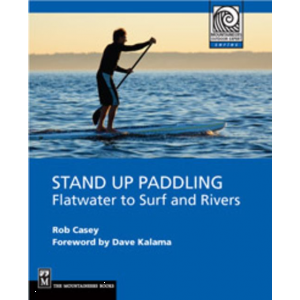 The 6th edition (2018) has been updated and revised by Wayne Horodowich, who is Derek Hutchinson's (original author) longtime friend and paddling partner. Because of the contributions of two different authors, I found some of the chapters a little disjointed and out-of-date. Nonetheless, the book was an informative read and provided some new and enjoyable perspectives. 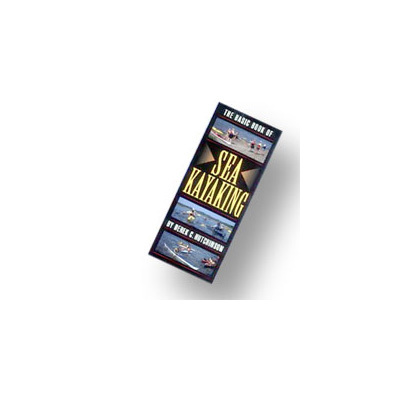 Background: This book was first published in 1976 (back then it was titled Sea Canoeing) and is said to be the first book ever about the subject. 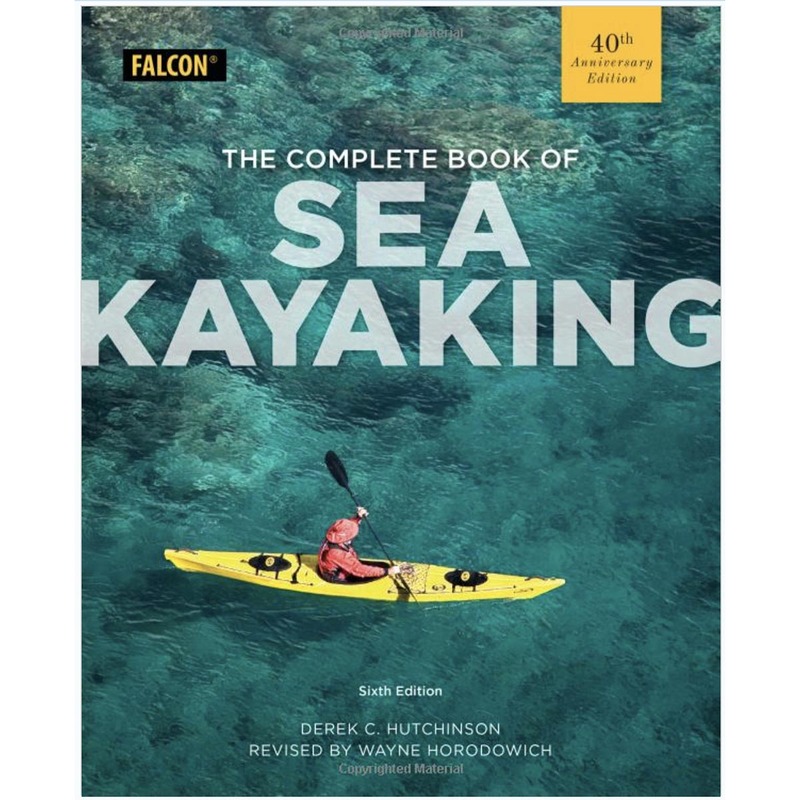 The author, Derek Hutchinson, is considered by many the father of modern day Sea Kayaking. He oversaw and contributed to much of the sport's evolution from the 1970s through the '90s. (On a side note, I didn't even take up sea kayaking until the year 2000.) 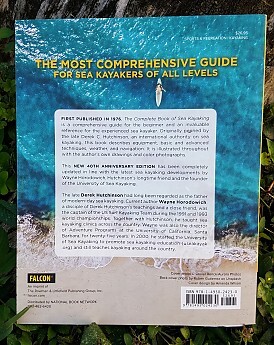 Derek passed away in 2012 and this 6th edition is an attempt to update and revise the book by his longtime friend Wayne Horodowich, the founder of the University of Sea Kayaking. 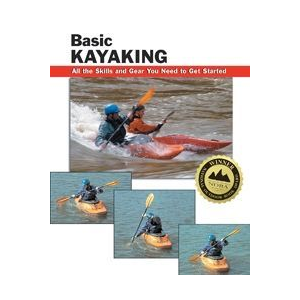 How does this book benefit a newbie or even experienced paddler? Both Derek and Wayne were/are Sea Kayaking instructors and have taught probably thousands of students on the subject. No doubt, they are some of the most experienced people ever to paddle and more importantly, teach and write about it. The techniques and skills detailed in this book have been applied, tested, and refined by the experiences of the authors as well as their many students. In having to communicate some pretty complicated skills to their students, they have developed a way of transforming these skills into words and onto paper. 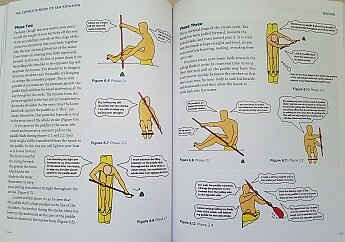 The illustrations, hand-drawn by Derek himself, go further to depict the skills in two dimensions. There are even some illustrations that portray a "Fish Eye View" by rotating the book upside down. That being said, I am a visual person and learn best by seeing something demonstrated and then replicating it. I have a hard time learning a physical skill from just a description. In my opinion, the best way to learn most of these skills (strokes, rolling, bracing, and capsize recovery) is to spend a lot of time watching videos and/or then practicing them. Better yet, it would behoove most people to first take a class with a certified instructor. Skills such as rolling should initially be practiced under the supervision of someone that knows what they are doing. Thus, this book really serves as a reference catalog of the the skills and not as a stand-alone guide on how to perform them. Other chapters covering equipment, tides, currents, waves, weather, navigation, and trip planning are more straightforward...all information that can be digested by a self-taught student. 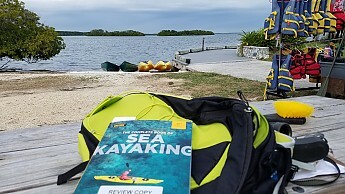 Ideally this book can serve as a foundation, reducing the need for stuffy classroom time so that a paddler can focus all their instructional time/money watching and practicing on-water skills. The chapters follow in a logical sequence, from the most basic information to more advanced topics. 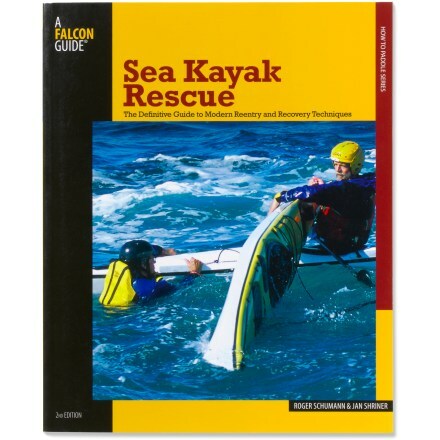 Capsize recovery skills (Chapter 2) are covered before all other skills, even before strokes and maneuvering, because it is more critical that a paddler be able to recover from a capsize than paddle effectively and efficiently. I found this chapter (33 pages) to be the most helpful chapter of all. I have always been able to self-recover and can even roll most of the time, but the information was a good reminder of all the different ways, assisted and unassisted, that a paddler can exit and re-enter their boat. Most of the people that I have paddled with over the years cannot self-rescue, so it's not enough to know how to recover on your own. You should also know how to assist other paddlers. 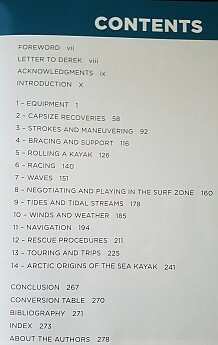 Another chapter that I appreciated is the last one: Chapter 14 Arctic Origins of the Sea Kayak. I think it's important to pay homage to the original sea kayakers and I have embraced Greenland style kayaking techniques in my own paddling. 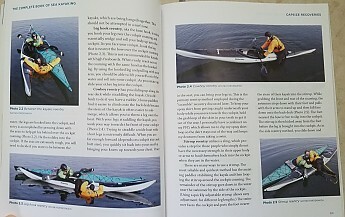 I enjoyed Derek's coverage of the many different styles of kayaks and paddles from all around the expansive arctic region. He includes some cool pictures and it sounds like he really did a lot of research into the subject. The chapter I found least useful was Chapter 6 on Racing. 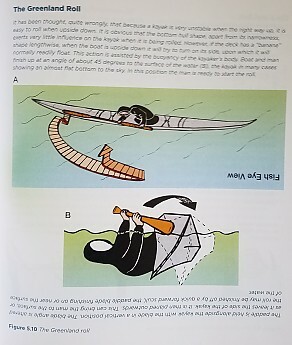 There is a lot of information about the racing stroke, using a wing blade, but it was pretty hard to follow the illustrations. When I learned to row crew, I had a coach. 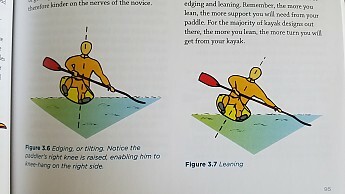 In the same way, I think competitive kayaking is best left to coaches to instruct, not a book. It's nice that this chapter is included, but it could perhaps be replaced by a more pertinent subject such as a more thorough description of GPS use in navigation. Related to this, I thought information covering technology and electronic devices was most lacking. It's true that technology often advances at a faster pace than books can be published, but some of the information is really outdated. For instance, there is a brief section covering EPIRBs and PLBs (Personal Locator Beacons) in which the discussion turns to pulling a pin and the prohibitive cost of such devices ($600). In recent years, these devices have made leaps and bounds in becoming cheaper, more user-friendly, and tiny enough to fit in a pocket. Several PLB's weigh around four ounces and cost from $200-300. Such devices are now a mainstay in the hiking community and it has been a very long time since any involved pulling a pin. Likewise, there is no mention of satellite messenger devices such as Spot Messengers or Garmin InReach units. All of this technology greatly enhances emergency communications, both on and off the water, and has been a part of my paddling and hiking equipment for the past five years. There is also no mention of smartphone apps that are relevant to paddling. I can name at least 10 that I currently use for weather forecasts, weather radar, tide/current information, and navigation. Maybe use of a smartphone is a bit iffy when on the water (it's hard to paddle with a phone in your hand), but they certainly have their place in planning a paddle, as well as communicating such plans to friends and relatives. I would like to see the book updated to include some of these newer technology options. Final Thoughts: This is more or less an observation about the author's British roots and place in paddling history. Derek paddled most around his UK homeland and so this obviously plays heavy in his review of weather, navigation, and many other topics. If you paddle around the British Isles primarily, you would find this book to be very relevant. Other places, especially Florida, not as much. Wayne tries to generalize some of the content, which just makes it feel disjointed at times. Derek also uses some terminology that confused me. For instance, in the Chapter on Navigation, he refers to two markers in a line as a transit, whereas it is known to mariners in the US as a range. He also employs a lot of dry British wit as well as anecdotes and stories. It gives character to the book, but can be a bit tedious if you are looking for more of a straight textbook-style of book. I appreciated his humor and opinions, for the most part. If nothing else, this book gave me some perspective into the early pioneers of an activity that I love so much. Thanks to Falcon and Trailspace for the opportunity to read this edition. I began paddling as a teenager, learning the ropes from my parents' rafting guide friends. I went on multiple Western River expeditions with my family, utilizing inflatable rafts and whitewater kayaks. When I moved from Colorado to be near the ocean, I determined that I should have a sea kayak. I've owned one or several ever since I was 23 and have paddled in Hawaii, the Mariana Islands, New Zealand, the Pacific Northwest, North Carolina, Maine, Maryland, Mississippi, and almost every waterway in the whole state of Florida, from the Keys to the Suwanee River. Much of my success as a sea kayaker can be directly attributed to my formal education and professional experience as a mariner and boat captain. Obviously there is a lot of crossover in having spent years of my life on ships at sea. This has given me the confidence to organize many successful multi-day expeditions and paddle distances of over 30 miles in a single day. 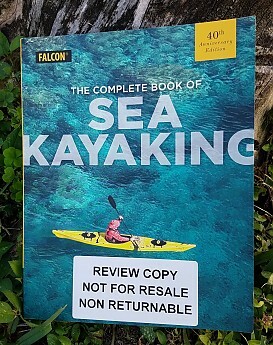 I have also taken a few formal rolling classes, but I had never read a book about sea kayaking, until now. Thanks for checking out this book, Twig! 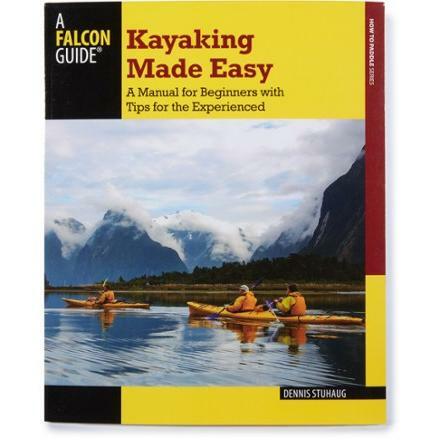 The Falcon Guides The Complete Book of Sea Kayaking is not available from the stores we monitor.